So one of the biggest challenges around innovation at the moment is fear. And fear is not just about fear of looking stupid but there’s a range of issues. There’s a fear of sounding like you don’t have knowledge about it. There’s a fear of people not accepting you because you’re saying things that are just outlandish to them. There’s a fear that you’re going to be held accountable for mistakes. There’s a whole lot of fears that are driven in the organisation. And so if you want to try and get innovation and creativity going in your organisation, there needs to be a lot of focus on managing fear. We have a problem at our education system at the moment that it’s intended to be a factory system. So you go into a classroom, and we learn this is the way we do Math, this is the way we do English, this is the way we do Science. And it’s designed because we need to be efficient. We’re dealing with thousands of kids. We’re trying to handle one teacher with multiple students. So a factory line becomes the way we do education. When we go into the workforce we sit down, and then introduced into the organisation; so this is how we do things, this is why we do things and so on. Now one of the problems is Einstein was thrown out of school because he kept asking, “Why?” That’s what made him such a creative genius. So the hard part, we actually discourage students from asking why and that gets taken back into the workforce. So we sit down and we are in a board meeting or in a management meeting, there’s 20 people around the table, trying to solve a—it’s very difficult for somebody to put their hand up and say, “I think we should look at doing this….” People are fearful of judgment. They fear of looking stupid. Often when you make a comment, you make a bold statement somebody’s going, “Oh, we’ve tried that. We did that ten years ago and it didn’t work.” And dismissed. See, we have an environment where fear actually stops the creativity of the organisation. We have a situation also is that that fear stops us from stopping bad projects. A good example I’ve seen recently was a computer system in one of the government departments. This system has been going on for ten years. It’s now gone over a billion dollars and it still doesn’t work. The hard part is that everybody feels that “I’m going to get sacked if this project fails.” So the fear is if I say, “Right, it’s not working, we’re going to pull the plug,” I’ll lose my job, it’s better to cover it up. So we see very good examples in companies where projects are going wrong and people’s fear that they’re going to be held accountable for it actually then drives them to cover it up. So if you really look at your organisation, there are considerable issues that are holding back the business, that are causing bad projects to continue and they should’ve been stopped, stopping the creativity of ideas, stopping innovation from moving forward all driven by the prospects of fear. 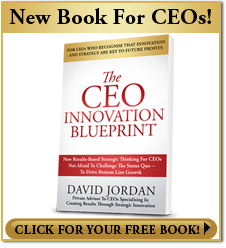 In “The CEO Innovation Blueprint” we talk about integrated thinking. And one of the challenges is that we focus on the low-hanging fruit, what was quick and easy to do to get to—to solve a problem, to produce a product, to sell, and the quickest, easiest way to sell to the customer. That’s a tangible component of business. What’s happening now is that the low-hanging fruits have been picked so we have to, as businesses, go up the next level. And this is where integrated thinking is really important because now when you have to deal with the intangible things. When you really look at it, it’s like the Iceberg Principle. An iceberg 2/3 of the iceberg is hidden below the surface and that is the biggest risk to shipping, it’s what’s below the surface, not what you can see above the surface. And when you actually look at businesses, that’s the same problem, the tangible component that we see, that’s obvious to us, we’ve already solved, we’ve already dealt with, tangible issues with customers were already dealt with. What we haven’t dealt with is the intangible stuff—that’s the complicated, under-the-surface components. An intangible is not this one big issue that we can solve. It’s a sum of lots of small issues. So integrated thinking is about how I can pull lots of separate components together and solve them as one process to actually get the value for the company and to get the value for the customer rather than just I’ve got one big issue to solve which is what we’ve done in the past. 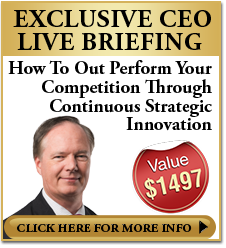 “The CEO Innovation Blueprint” actually talks about an issue of really the focus of innovation really should be about profit. That’s the whole point of business. And strange as it may seem is that a lot of innovations don’t focus on growth or profit for the business. The issues that we see, an example, is the banking sector where a lot of innovation is to try and keep up with what the competitors are doing. So when we look at internet banking products or smartphone apps a lot of those are; “Well, the competitor’s got a smartphone app, we need to have a smartphone app.” And whilst that may be important to keep your customer base, it’s not actually contributing to growth and profit. When you think about a bank, its key profit line is lending. And then you look at the smartphone app, and there’s nothing about lending on the smartphone app. Then how is that smartphone app helping the bank contribute to its profits? It’s often that we are driven by the excitement of the technology. I always like the story from a long time ago, it’s not exactly true but it’s a good story. NASA spent a million dollars trying to design a pen that works in space. Because basically, pens rely on gravity, there’s no gravity in space, how does the ink run down to the nib? The Russians took a pencil. It solved the problem. So a very good example, sometimes we get caught up with the technology to solve the problem when there’s actually a simpler solution. So again, it’s very important to be focusing on profit not on the best looking technology, not trying to keep up with the competitors, it’s all about trying to make sure that when I invest money in this innovation, how will it drive profit? And how will it drive growth? 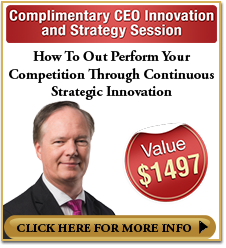 In “The CEO Innovation Blueprint” is the focus on profit as a strategy for innovation. And a very good example was in early ‘90s we had the .com boom and bust. And basically, in the organisation that put the word “e” in front of it like e-commerce became popular and it was getting caught up with the technology. We tried very hard to talk with our clients to step back from technology and really focus on the business model. Those companies that survived the ‘90s .com crash, organisations like Amazon actually had a very strong business model. Those that didn’t have a good business model were just playing around with the technology failed very quickly. So it’s very important, if you’re trying to compete with other companies, is to actually focus first on the business model, second is, what is the problem that we’re solving for the customer? And then look at the innovations and technologies that will work for us.